THIS interesting block harks back to the neighborly custom of begging one's friends for scraps of their frocks, or for the men's old neckties to put into a quilt. In piecing, first sew the small triangles onto those marked red, to form an oblong exactly the same size as the one marked yellow. Two of these oblongs and one yellow are pieced together as shown to form the small square block. 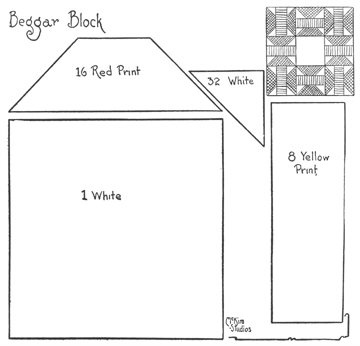 It takes eight of such pieced squares and one plain center to form a beggar's block eleven inches square. While these are marked in colors for a calico quilt, this is an excellent design to piece with brighter colored scraps of silks and wools, set together with black, navy or some dull color in the places marked white. The patterns are the size of the pieces after they have been sewed together, so cut each a seam larger on all sides. Material estimate: There are 36 pieced blocks in this quilt set together with white strips 11 by 3 3/4 inches, plus seams. Fill in at the ends of the strips with squares of yellow, add strips top and bottom for length. 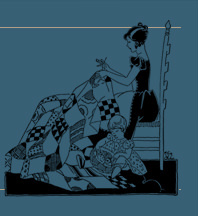 Your quilt will then complete about 84x91 inches. This will require 1 1/2 yards of yellow, 1 yard red and 6 1/2 yards of white-a total of 9 yards of material.